click to see printed page. 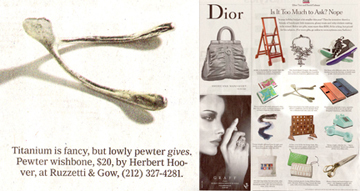 "Titanium is fancy, but lowly pewter gives. at Ruzzetti & Gow (212) 327-4281." Scroll below scanned image to read text of article. the former president's — the East Harlem-based visual artist's. foods with docking holes, "you know, the 13 holes on a cracker,"
him photos of posed crackers in situ around the world. get it out.' " Like a diamond, these cookies are forever. "What I'm Wearing Now; The Eco-Fashionista"
"I also love this silver-dipped Saltine cracker that I got from the vending machine at the MoMA. I found a chain that slips through it, and I wear it as jewelry. People are always like, ''I love Saltines, too!'' I think it's kind of chic." The community machine from Utrecht on 4th Ave and 11th Streen in NYC was hauled over to the Rachael Ray Show for a fun segment on vending machines. Rachael has a mild episode of vending rage. My cracker is on top, but has unfortunately fallen over so it's a bit hard to see. Crackers featured on the under $25 page! Get them on the Objects page. J a n u a r y, 2 0 0 7. Art-O-Mat limited-edition artist book released. The first in a series of Art-O-Mat artist books. 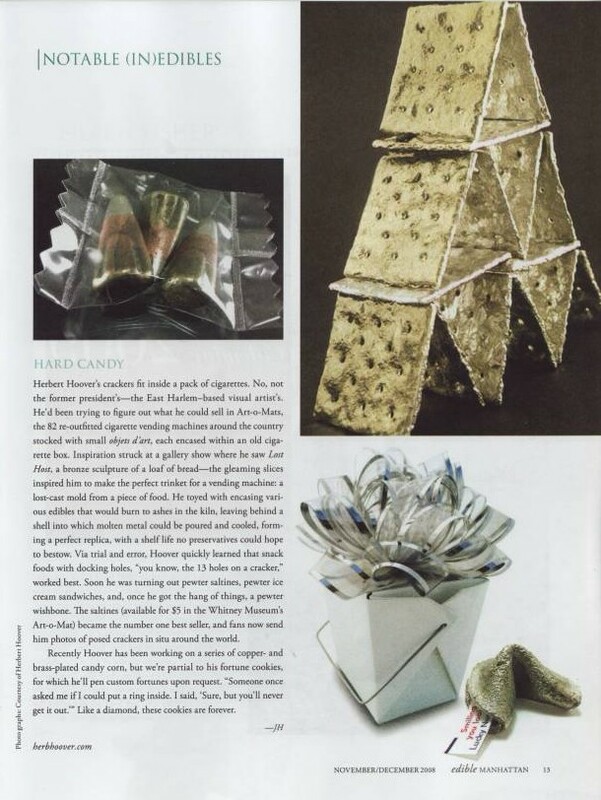 Each page of the edition is original art created by a participating A.I.C. machine artist. 10 years of Art-O-Mat! Can you believe it? Check out the picture of Clark with Herb's cyanotype inside the machine. 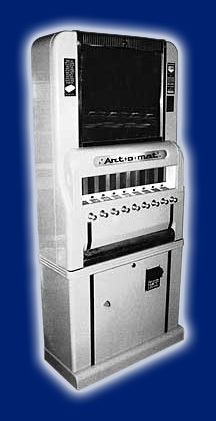 Herb created the faceplate specially for that Art‑O‑Mat machine. Nice Piece on the Art-O-Mat. At the other side of the spectrum sits Herbert Hoover's Cracker series. Hoover may be a talented pewter caster — he made the new knobs this Art-o-mat sports, but here he shows the worst of what happens when artists create factory-imitating products. Each "Cracker" is exactly that — a saltine dipped in pewter. They say all press is good press, but this guy really hated my work enough to suggest dipping real saltines into molten metal. Unfortunately, anyone who tries this at home in Detroit will get a face-full of exploding pewter lava and a trip to the facial reconstruction unit at the local burn center. Seriously folks, never put anything into molten metal except more metal! I'd also suggest preheating the cold metal before adding. 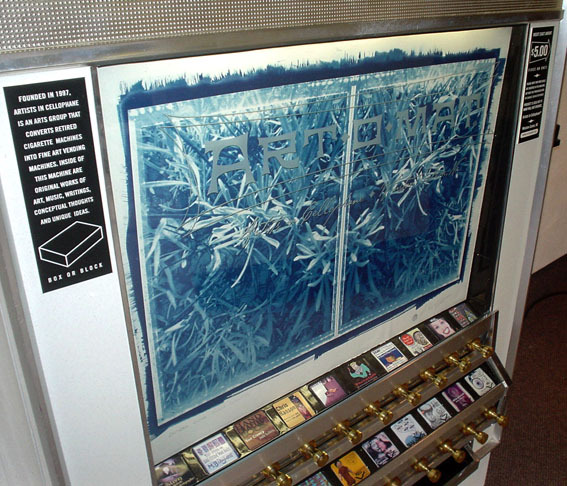 SECCA Art*O*Mat machine with lavender cyanotype by Herbert Hoover. The faceplate will be on exhibit inside the machine for three months. After that, it will be auctioned by SECCA to help fund the museum programs. With my first $5 token, I get a brown box marked "Cracker" by an artist named Herbert Hoover of Harlem. Inside, folded in nifty silver bubble wrap, is an unmistakable Saltine cracker, cast in pewter, a neat-o bit of pop art to be served with Andy Warhol's soup cans. 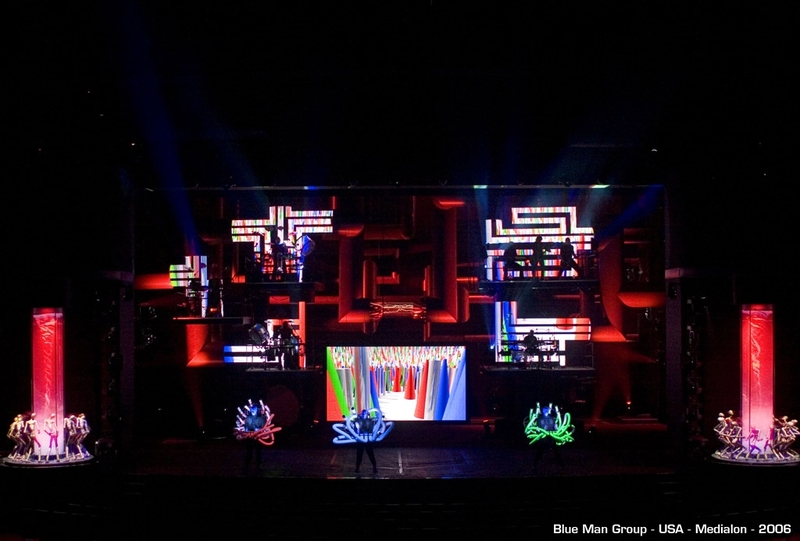 Blue Man Group moves their show, including my zoetropes, from the Luxor Theater to The Venitian Theater in Las Vegas.